Being on Instagram all the time can seem like an anti-social way of living to someone who just scrolls their feed and likes a few photos here and there. But as a blogger, it’s my job to interact with people online. And do you know what? I’ve actually made some great friends who love the same things that I do! So in order to show a little love to our Insta-friends, a group of us DIYer’s decided to exchange valentines this year. Now when you decide to do a valentine swap with a bunch of super creative and talented ladies, it can be a little daunting. I thought, what do ladies really want for valentines day? Roses? Chick flicks? TACOS! PIZZA! DONUTS! Junk food is just universally loved. Like, remember when people freaked out about the taco emoji? It was an outrage that there wasn’t one! Makes me hungry just taco-ing about it. So I decided to incorporate some of my fave junk foods into my valentine this year. With a slew of horrible puns, donut you know it. These cards only require paper, scissors, tape, and markers – cheap and easy! Check below for the full tutorial for each. Are you sending out valentines this year? What foods would you use if you make these punny cards? 1. 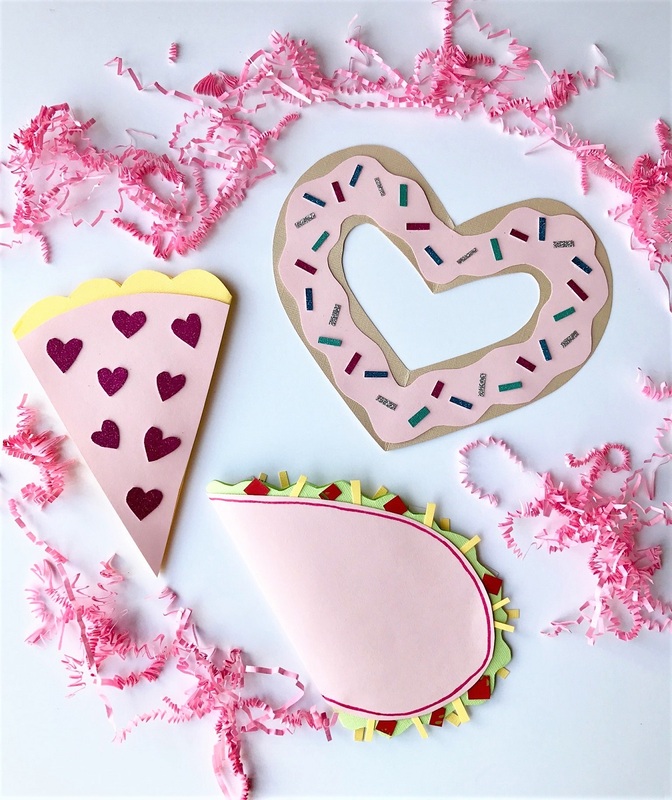 Start by folding your pink paper in half and then cutting out a large half heart (like you used to in elementary school), so that you can unfold the paper and have an even heart shape. This will be your taco shell. 2. Fold your green paper in half. Using your yellow heart as a guide, cut out a wiggly half heart that is slightly larger than the yellow heart. This will be used for the lettuce. 3. Cut out some small squares from the red paper for the tomatoes and strips of yellow paper for the cheese. 4. Assemble your card by taping the tomatoes and cheese into the leaves of the lettuce. Then, tape the taco shell to the lettuce so that when you open up the card, the inside is green. 5. 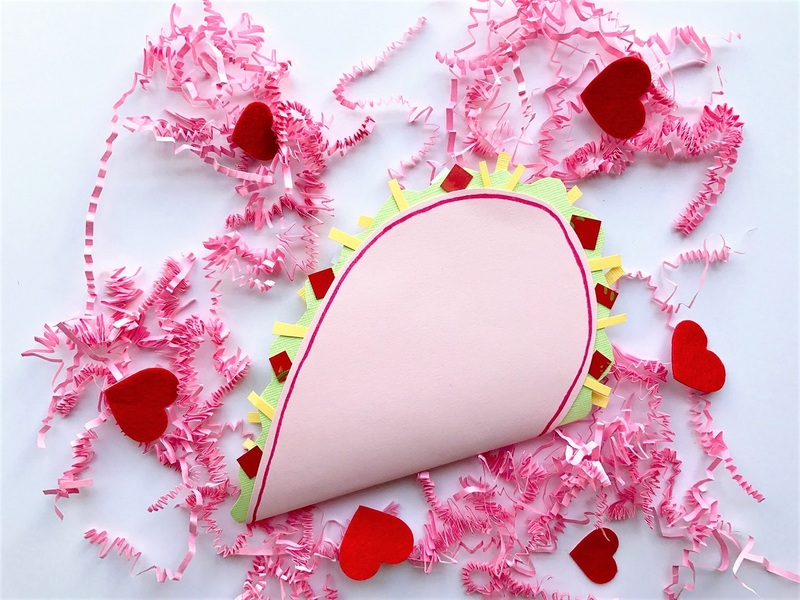 Write the phrase “Taco-bout true love” on the inside of the taco. 1. Start by folding your piece of yellow paper in half and cutting out a large, curved triangle in the shape of a piece of pizza where the folded edge is one edge of the pizza slice. Cut along the curved edge to make it slightly bumpy. 2. Cut out a triangle out of the pink paper that is a little smaller than the yellow triangle to use for the sauce (you should have some space for the crust to show at the top). 3. 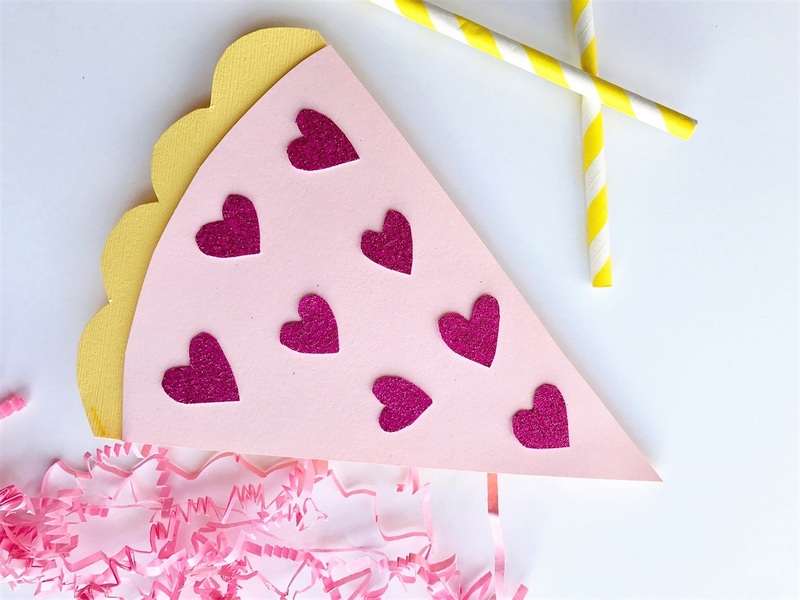 Cut out some small hearts from the sparkly red paper to act as heart shaped pepperonis. 4. Assemble your card by taping the tomato sauce to the pizza crust, and then taping the meat onto the sauce. 5. Write the phrase “You’ve got a pizza my heart” on the inside of the pizza. 1. Start by cutting a large heart out of your beige paper. Then cut a smaller heart out of the middle of the big heart. This will be the donut. 2. Next, use the heart you just made as a stencil to cut out a pink heart of the same size. Take the pink heart and cut squiggly lines around it so that it is slightly smaller than the beige heart. This will act as the frosting on the donut. 3. Next. 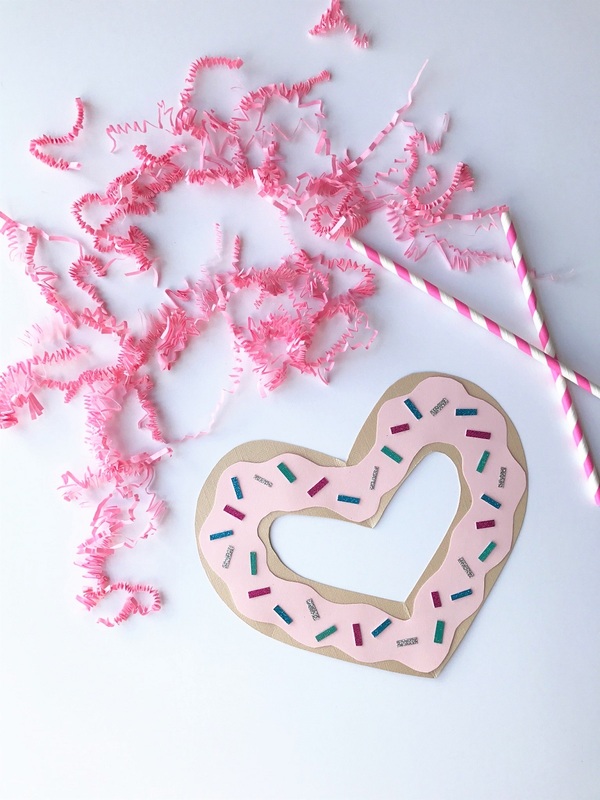 cut out small strips of multiple colors of sparkly paper to use as the sprinkles. 4. 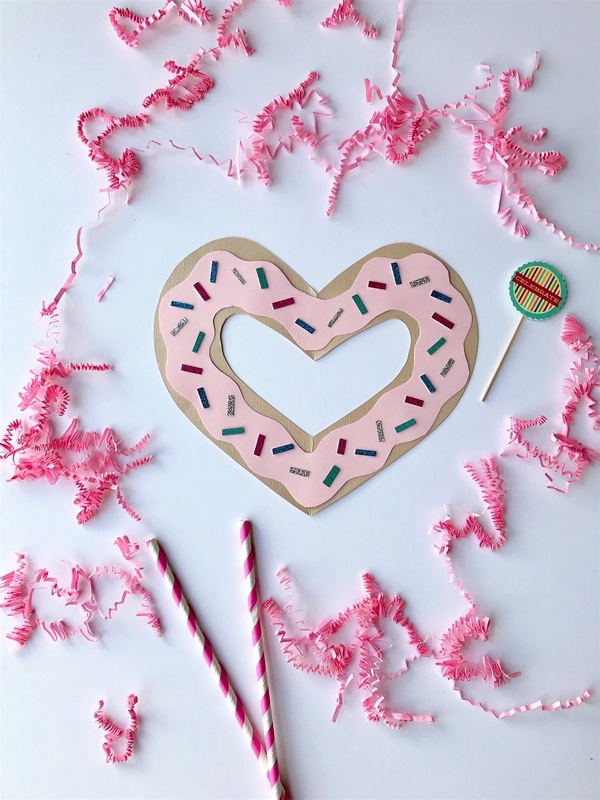 Assemble your card by taping the frosting on top of the donut. Then, tape or glue the sparkly sprinkles all over the frosting. Finish by using your marker to write the phrase “I donut want to let you go” on the back. 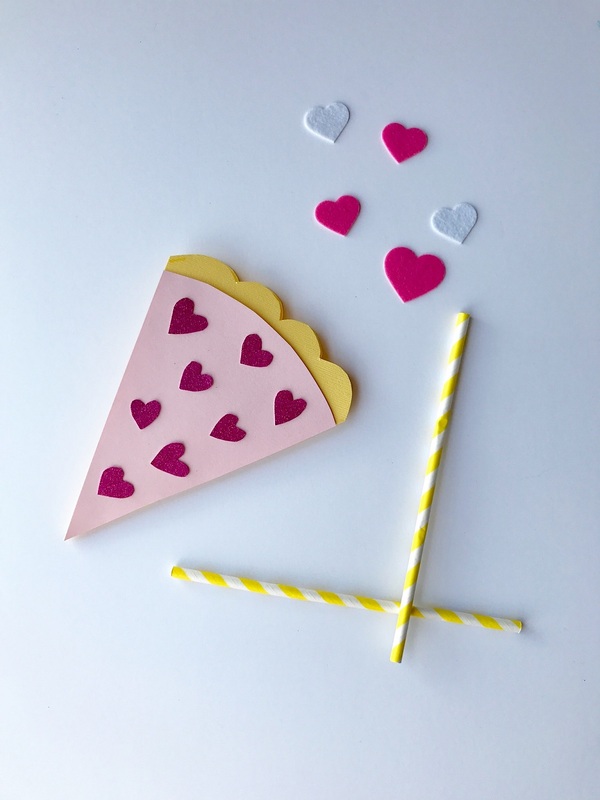 Very adorable, will be definitely try making them with my toddler this valentines. Awesome! I’m so glad you liked them, I think they’re a great craft for kids too! I love that taco so much! I am totally on board with junk food cards! I like the taco one especially! These are the cutest things ever! I also really love your photos! Thanks I loved how they turned out! !